How do we know if our cats are happy? With dogs, its pretty easy. They wag their tails, lick our faces, greet us at the door. But what about cats? Sure there are cats that will lick your face, or greet you at the door. But as a species, cats are pretty silent about their contentment. We do however feel that cats can make it quite clear when they are unhappy. Cat owners often complain about unwanted behaviors such as urinating on the laundry, shredding the couch, or biting their human and animal housemates. While it may seem like these behaviors are your cat saying "you came home too late last night", they are often just natural cat behaviors being expressed in an unacceptable way. 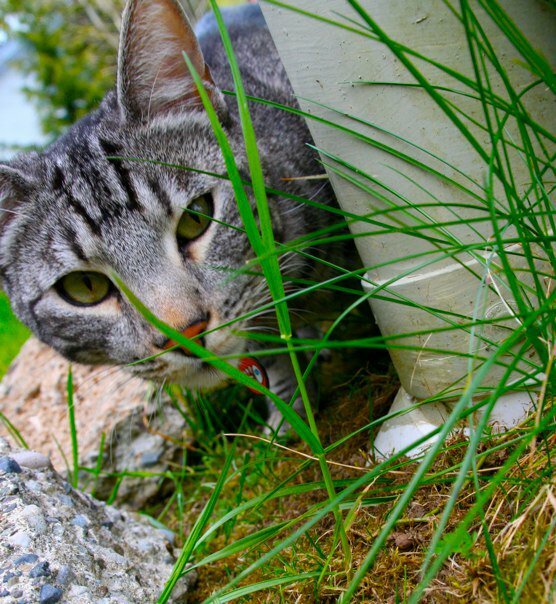 This blog series is designed to share what we know about cats' natural behaviors, and what we can do to enrich their lives. Most everyone knows now that scratching is a natural behavior for all cats. Scratching is how cats stretch their muscles, shed and sharpen their claws, and leave their scent on objects in their territory. Trying to stop the behavior will be futile. Yelling and chasing your cat around the house with a squirt bottle only results in frustrating both of you, and damages the relationship between you and your cat. Our best option is to try and find an acceptable way for this behavior to be expressed. Your cat will be happier for it! The key is finding out what your cat likes to scratch and where they like to do it. This may not mean spending hundreds or thousands of dollars on cat scratching contraptions (some of you know this method too well). Observing their scratching behavior can help narrow things down a bit. Do they like to scratch vertical surfaces (like the legs of the couch), or horizontal surfaces (like the carpet or rug)? Do they like rough surfaces, or smooth surfaces? Where they like to scratch is also important. Often it will be near a door or window (remember, they do this to mark their territory). When you think you have it narrowed down, purchase a couple of scratching devices, and take some time to observe your cat. They may not take to it right away, and you may need to play around with the what and where a bit, but it will be well worth it when you don't have to replace the couch (or cover all of the furniture with blankets like many of us). If it doesn't work right away, keeping the nails trimmed and using those glue-on nail caps can help minimize the damage until you get it right! Stay tuned for issue #2 of Happy Cats, where we'll talk about inappropriate urination, and what you can do to reduce or "eliminate" this behavior. Newer PostWhat is a Feline Specialist?